Rarely in theatre does lighting stick in the memory. 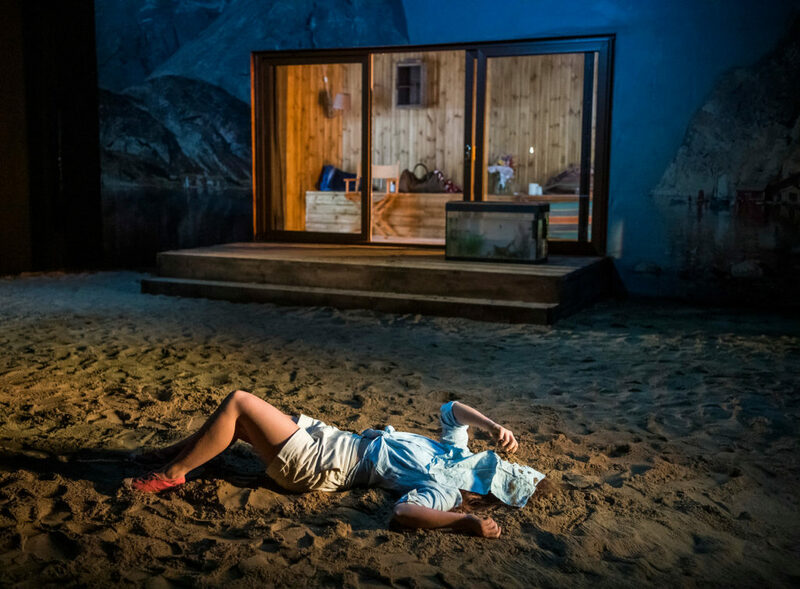 But in The Lady from the Sea, a production from the Norwegian Ibsen Company at The Print Room in London, it shone through. As the performance begins, the lights come up to reveal a scene reminiscent of an Edward Hopper painting. We look through across the stage, through French windows into an entirely wooden, sauna-like house, and a family stringing up bunting, perfectly cast in a sharp, yet respectful glare of sunlight. The bunting is for a birthday celebration though, this being Ibsen, it is no conventional birthday. Dr Wangel and his daughters are celebrating the birthday of their wife and mother, who died some years previously. The family now live in with Wangel’s second wife, Ellida, an eccentric who brings her own heartaches. Ellida mourns both the death of her and Wangel’s only child, who died as a baby, as well as the disappearance of a mystery lover who both fascinates and scares her. During the play, Ellida confesses this love to Wengel just as her lover conveniently returns from a long voyage to taunt her with the prospect of alighting with him. Though the Norwegian Ibsen Company are, unsurprisingly, Norwegian, and most of the audience Norwegian speakers, performing in London means they have translated much of Ibsen’s dialogue into English. Nevertheless, a considerable portion remains in the original language, with surtitles projected above the stage for Anglophones like me. Having both languages was both enhancing and distracting. It was, of course, enjoyable to hear the play in the language in which it was written but, constantly looking up to the surtitles, it meant much of the cast’s expression was lost, literally, in translation. Going bilingual has also meant Ibsen’s text has had to be reworked to make sense. Doctor Wangel and his daughters have been made British expats in Norway; able to speak Norwegian but more comfortable speaking English. This subplot is both unlikely and largely unexplained, though it has enabled the company to hire a multicultural cast. Wengel (Adrian Rawlins), his youngest daughter Hilde (Molly Windsor) and their artist acquaintance Lyngstrand (Edward Ashley) are all British performers; while Wengel’s elder daughter Bolette (Marina Bye), Ellida (Pia Tjelta), The Stranger (Øystein Røger) and the tutor Arnholm (Kåre Conradi) are all Norwegian. Molly Windsor as Hilde in the thick layer of sand covering the stage. The painted backdrop and wooden interior are visible behind. After years taking small parts in Oslo, Pia Tjelta rose to fame in Norway last year, appearing in State of Happiness, which won two awards at the Festival de Cannes. I saw her interviewed a few weeks ago at a recording of the Norwegian-Swedish television talk show Skavlan. Unfortunately, Tjelta does not speak clear English so, though Scandinavian speakers may have been grateful she had Norwegian to fall back on, much of her dialogue was lost on me. That being said, her performance did grow considerably stronger in the second act, with real tears becoming frequent. Of particular note is her handling of a confrontation scene with The Stranger at the end of the first act, during which The Stranger informs her that he will return to collect her later that evening. Coming at the end of the act, it would be easy for Tjelta to leave and allow the lights to fade. But, bravely, she decides to stay on stage for longer, allowing us to look into Ellida’s extreme state of procrastination. For me, the strongest performance came from Kåre Conradi as Arnholm, Bolette’s former tutor brought in by Wengel to coax his wife out of her misery. Arnholm misunderstands Wengel’s letter and assumes he wishes him to coax Bolette into marriage. This is a dilemma Conradi handles impressively; effortlessly blending naturalism with strong emotional responses at certain moments. Having appeared in numerous English-language plays and series (most notably in an episode of the BBC’s Shetland), Conradi feels more natural in English than Tjelta. His performance is solidly naturalistic and though, at times, it feels as if he is speaking to a camera rather than an audience, his dialogue at all times audible. Equally, his ability to break with naturalism when necessary – most notably when he delivers a desperate plea of love to Bolette – is powerful. Ibsen was an early commentator on female inequality in Norway. In this play Bolette is powerless to resist Arnholm’s desperate moves, and Ellida feels unable to resist the lures of The Stranger, however dangerous and controlling she knows him to be. Meanwhile, though weak and incompetent, Wengel feels it Ellida’s duty to stay with him and, though equally weak, Lyngstrand demands Bolette think only of him for a year while he sculpts in the Mediterranean. Audiences of an earlier generation may pass these moves off as persuasion, but for a contemporary audience that does not suffice. The Lady from the Sea is blessed in that the action takes place in one location on consecutive days. Director Marit Maum Aune has employed set designer Erland Birkeland to cover the front of the stage in a thick layer of sand, while a mountainous landscape has been painted above the doorway, perfectly lit by the designs of Simon Bennison. By staging the action on the beach, we feel part of the sea’s mysterious lure, a lure that explains Ellida’s pull to The Stranger and to the region in which she has spent her whole life. But the sand is, of course, not only employed to establish a sense of place. It is used also to slow the action and, most powerfully, it is used as a prop. At the beginning of act two we watch Ellida sculpt the figure of a baby from the sand and cuddle it, and later we watch Hilde bury her head with it in despair. These are extraordinarily beautiful uses of a minimalist, structured, and beautiful set, only enhanced by unexpectedly beautiful lighting.